Peridot is the gem variety of the mineral Olivine. Its chemical composition includes iron and magnesium, and iron is the cause of the yellowish green colors. 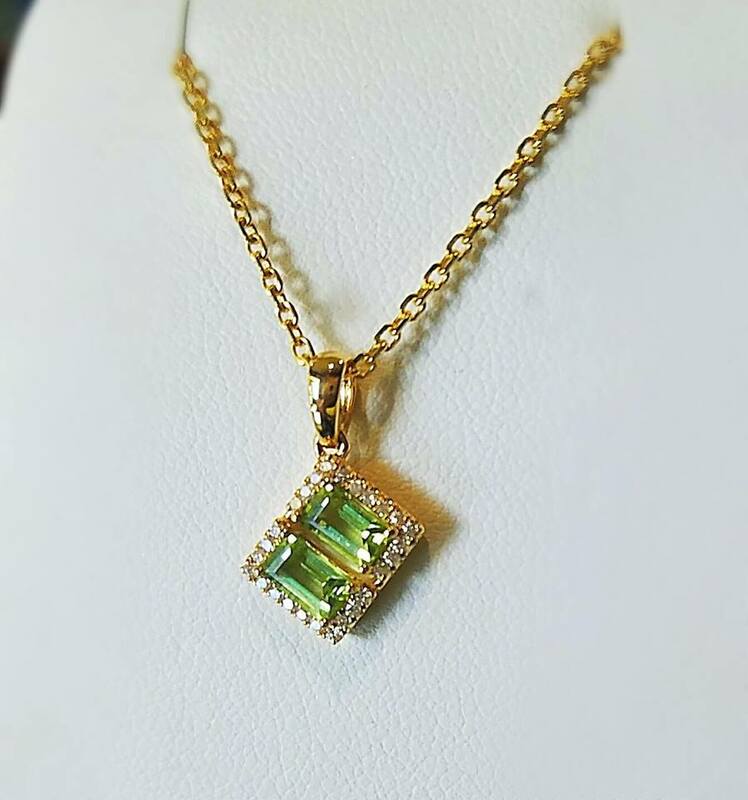 Peridot is named after the French word peritot, meaning gold, because the mineral can vary towards this color. 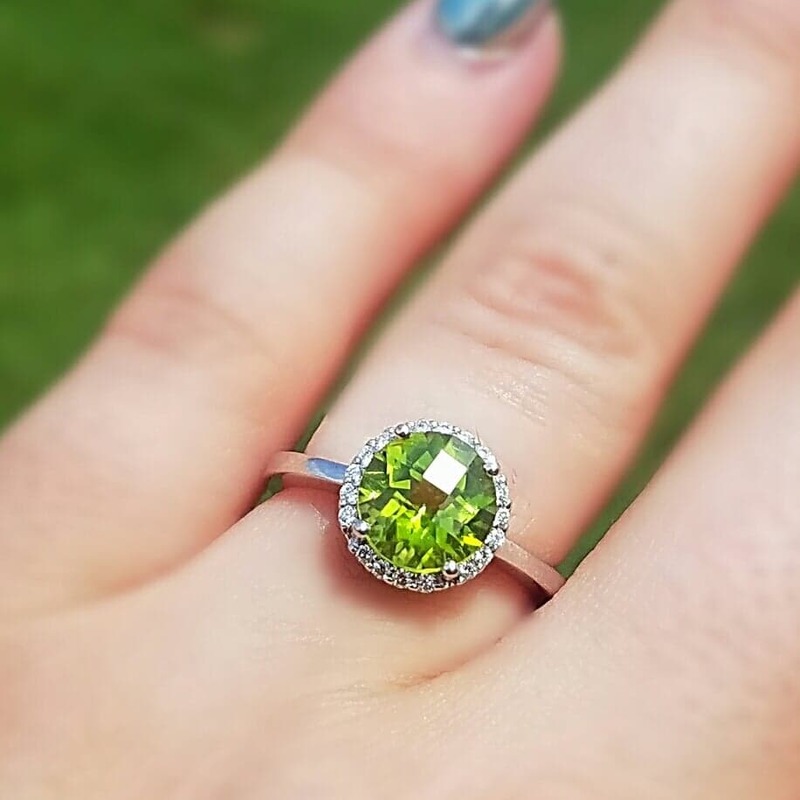 The color range for peridot is narrow, from a brown-green color to yellowish green to pure green. Gem miners find Peridot as irregular nodules (rounded rocks with peridot crystals inside) in some lava flows in the United States, China, and Vietnam and, very rarely, as large crystals lining veins or pockets in certain types of solidified molten rock. Geologists believe both types of deposits relate to the spreading of the sea floor that occurs when the earth’s crust splits, and rocks from its mantle are pushed up to the surface. Sometimes—as in Myanmar— these rocks can be altered, deformed, and incorporated into mountain ranges by later earth movements. Rarely, Peridot can have an extraterrestrial source, being contained in meteorites that have fallen to earth! 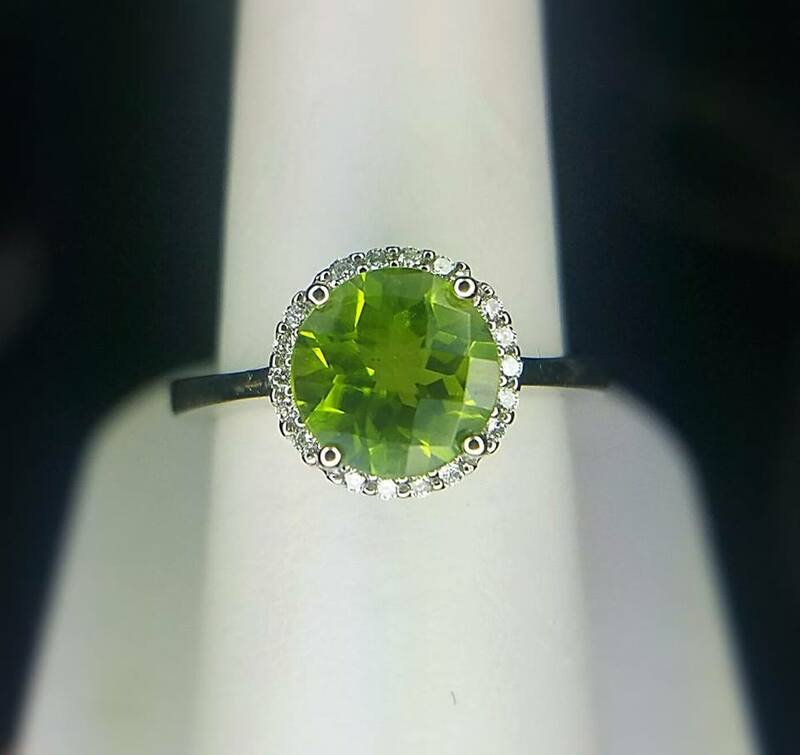 Peridot has been long considered to be an aid to friendship and supposedly frees the mind of envious thoughts. It is also supposed to protect the wearer from the evil eye. 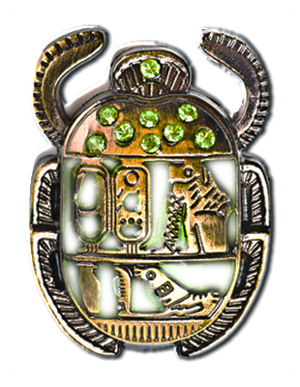 Other legends credit Peridot with bringing happiness and good cheer, attracting lovers, and strengthening the eyes. 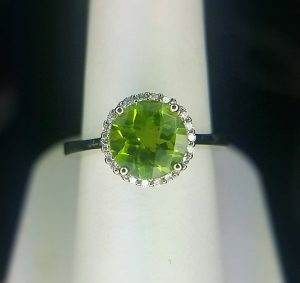 As with other gemstones, the color of the Peridot stone is directly related to parts of the body that it can be of aid to. 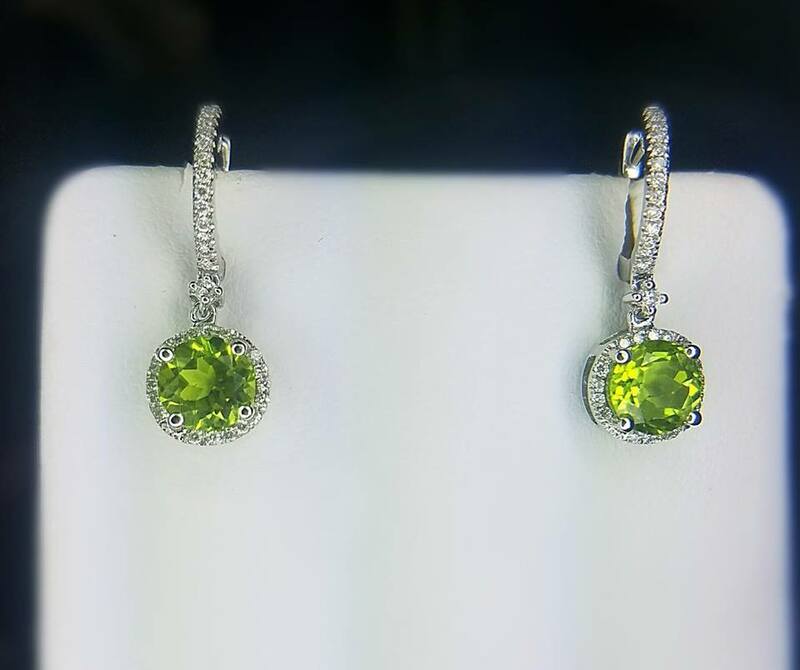 Because of its yellowish green color, peridot has been believed to cure diseases of the liver and difficulties with digestion. It aids in physical detoxification and helps problems with the kidneys, bladder, gall bladder, and the stomach. Peridot heals such illnesses as ulcers, constipation, and irritable bowel syndrome. It is also useful in helping to heal insect bites. Peridot has a tonic effect- it heals and regenerates tissues, strengthens the metabolism and benefits the skin. It aids the heart, thymus, lungs, and spleen. If placed on the abdomen, it aids in giving birth by strengthening the muscle contractions while lessening the pain. Peridot is also helpful in treating skin diseases and difficulties associated with the adrenal glands and endocrine systems. Peridot is 6.5 to 7 on the Mohs scale. It has fair to good toughness. Peridot is durable enough for jewelry wear but should be worn with some care so as not to scratch it or subject it to hard blows that can fracture it. Rapid or uneven heat can cause peridot to fracture. Peridot is stable to light but is easily attacked by sulfuric acid, and less easily by hydrochloric acid. It can also be attacked over a long period of time by acid perspiration. Warm, soapy water is the best method for cleaning Peridot. Ultrasonic and steam cleaners are not recommended.